Had the same error, fixed like described in the post you quoted. Thry this dual_iso.mo file and replace it with the dual_iso.mo file already on your SD card. btw I'm impressed for your high fps research you're going to make something revolutionary! Never tried dual iso with lower bit depths, will see if I can test it today and see what happens in MLVapp. Thanks, I'm just changing small stuff in the crop_rec source code provided here on Magic-Lantern site, the basics are provided by others. There is a lot of talk lately about 1x3 mode, basically binning 3 pixels on horizontal lines and reading every vertical line, no line skipping. To get highest possible height, select aspect ratio of 2:1 in raw video menu. After resizing the video to 1/3 of it's original vertical size, you get about 614 pixels resolution. 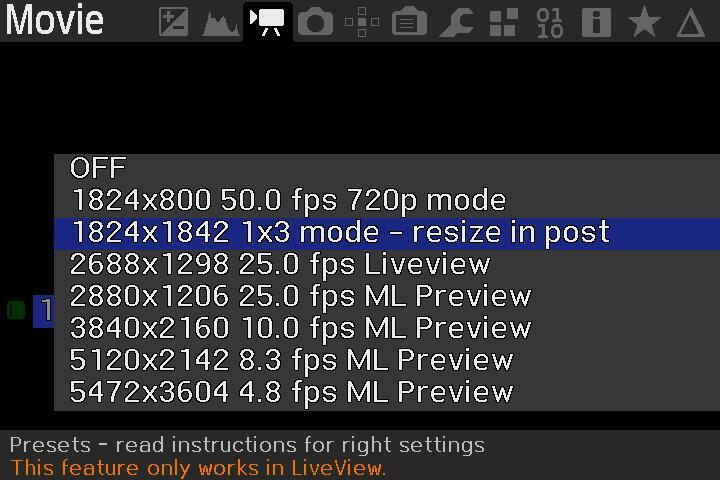 So for end results in 2:35 aspect ratio, you can set raw video menu to 1440x1842 resolution -> which gives resized in post 1440 x 614 effective resolution. 1440x1842 in 14 bit lossless gives about 5 seconds recording time. Couldn't get higher then 1842 without getting corrupted frames, so for now, looks like 1842 is the max vertical resolution in 25fps. There is no way to record 2.35:1 raw video even at 10 or 12 bit? What should the basic Canon video resolution be set at? 24", Rode Videomic Pro, Sony lapel mic. No, the 6D is perfectly capable in recording 'normal' raw video in 2.35 aspect ratio. The latest post I send is about recording in 1x3 mode, in 1x3 mode, every vertical line is recorded, no lineskipping is done. While horizontal pixels are binned by 3. The end result is a weird vertical stretched video which needs to be fixed in post, vertical size needs to be unstretched by factor 3. This build contains also lossless recording option. 6d gives you a max resolution of 1824 in normal non zoom mode, so in 2.35 aspect ratio = 1824x776 resolution. With 14 bit lossless option, this should give you continuous raw recording. I have such issue with crop mode shots. First frame is always black. Are you using the nightly build or an experimental build ? Try the crop_rec_4k build for 6d (doesn't do 4k on 6d...but this build has lossless compression option ) on the experimental builds download page. 14 bit lossless is probably even smaller in most situations then non lossless 10 bit. Didn't notice black DNG's at the the start of a MLV with this build. Yes, i used experemental build. ok i try 4k build. how you get this? i use sandisk extreem pro 95mb/s and i got only 12-14 seconds in 1824x776 24p 14bit, 10bit continuous. So normal 14 bit gives about 14 seconds, but 14 bit lossless gives continuous. You need the ML build I linked in the post, it’s on the dowloadpage under experiments. Lossless option is in MLV_Lite module, not sure but I think it’s not in MLV_rec module. So enable MLV_lite module and disable MLV_rec module. Max resolution for 6d in 50fps is about 1824 x 800. You can shoot about 5 seconds in 14 bit lossless raw format in 50fps before the memory buffer is full and the camera stops recording. For 16:9 aspect ratio, you can lower the resolution to 1440 x 800, this will give you about 600 frames before the camera stops, so about 11 seconds. Hello guys. Using 6D for seseral years but only 2 days ago heard about ML. I have 2 issues with my 6D. 1) Camera doesn`t support continuos autofocus during video record, so I should stay still and can`t move when I record my vlog. 2) Camera doesn`t support video record when wifi on. So I can`t focus on myself through Android App on smartphone - I need to ask help for someone else to focus camera on me. Does ML solve these or one of these issues? Thanks in advance. Never used it, so not sure how responsive it is and if it works with all lenses or only STM, but the Canon 6d has a autofocus mode called 'live face detect mode' which works during video recording. 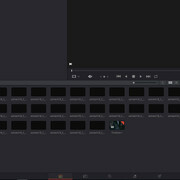 The long answer for no video support when wifi is on is, that it probably shares a DMA channel with the video encoder. Thanks guys! i fixed the problem. I deleted then instal ML again and it`s work properly. No black frame!! In menu "modules" i choose mlv. ver.2 module. Tried 4k build but it work bad. should I set canon menu video to 1080p or 720p? Am I able to use this for 16:9 final result video? when I set ratio to 2:1 1832x912 and 1824x912 is maximum resolution I could choose is that normal? on RAW video option it says "1824x912 3.00x" does that mean I got a 3x crop factor? what if I want to use that as 1.0x (entire full frame)? I tried to shoot a test but I got some trouble judging stretching after trying to get it natural unstretched looking. For slow mode 50p you've to switch to 720p (expect massive aliasing) and than stretch footage vertically by x1.69 in post. For maximum resolution use 1:2 ratio (not to be confused with 2:1), it's important to have the right aspect ratio, otherwise you can't select the maximum vertical resolution. The cops_rec preset I made are not (always) completely loaded/set when you select them, it's always good to use magnifying button to scroll through 1x, 5x and 10x zoom until back to normal view. That way everything is set, some say pressing menu button twice works too. 16:9 end result is possible, although in a very low resolution, because after unstretching the maximum resolution of 1842, you end up with a vertical resolution. of 1842 / 3 = 614 pixels. 614 / 9 x 16 = 1092 horizontal resolution for 16:9 ratio. So if you lower the resolution in raw video menu to 1092 x 1842, you can end up after unstrecthing with 1092 x 614 = 16:9 video. Hello I have a 6D with 1.1.7, I have installed 1.1.6 from here and installed ML but it doesn't work, the ML menu doesn't show up when I press Q, when I go to video on the screen appears shortcuts for iso and WB but that's it. I have uninstalled ML and installed again but it still doesn't work, I have searched the forum but I haven't found anything about this problem. I have a Tamron 24-70 f2.8 lens and 32 Gb Sandisk Card and the original battery. Do you have any ideas what could be wrong? The 1824x1026 (24p) resolution that is listed to be the maximum resolution with lossless compression; I am only able to achieve this in 12-bit lossless mode. Was anyone able to achieve this resolution continuously with 14-bit lossless? 1824x1026 in 14 bit lossless is not continuous. 1824x1026 in 12 bit lossless is continuous. Card writing speed from 6d just isn’t fast enough. You can get continuous in maximum resolution in 2.35 aspect ratio though. You could make use of the SD_UHS hack module. Giving you continuous recording in 1824x1026x24fps in 14bit lossless. After using the SD_UHS hack module, I was able to achieve continuous 1824x1026 14-bit lossless! Strangely enough however, following this test, I switched over to a different SD card that did not have the SD_UHS module, and was STILL able to achieve 1824x1026 14-bit continuously??? Don't know how this voodoo magic happened, but I'll take it. Anyone able to use crop_rec, lossless compression, and the dual ISO module all in conjunction? I get an "ISOless LV err(3)" whenever I try and activate Dual ISO. Searching the forums, I've seen a workaround involving the adtg_gui.mo and changing the values in CMOS  in dual_iso.c , but I am afraid I am not educated enough on the details to do this? The lossless compression is variable, it works better in low light scenes(underexposed) and scenes with less detail, so if you underexpose it compresses more, also using higher iso can cause compression to be less due to false detail created by iso noise. And max resolution in 16:9 (1824x1026) in 24 fps in 14 bit lossless floats around the maximum card write speed of the 6d.